Virginia Community Capital (VCC) has sold the historic former First National Exchange Bank building at 201 S. Jefferson St. in downtown Roanoke to Carilion Clinic, the region’s leading health care provider. 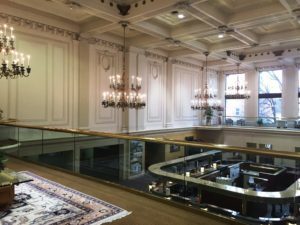 The iconic 55,000 square foot building, located at the corner of Jefferson and Campbell avenues, was donated by Wells Fargo – which used the building as a bank branch – to VCC in December 2017. The purchase of this building continues to build momentum for downtown redevelopment, following on the heels of the Campbell Court announcement last week and, in August 2018, the announced redevelopment of the Heironimus building. Carilion purchased the building for $500,000. Those proceeds will be reinvested in the Roanoke region to promote further economic opportunity and quality of life initiatives. VCC began engaging the community early last year by inviting community members to join facilitated conversations to share ideas for the building, offer insights on economic development needs, and discuss other ideas for the Roanoke area. The age of the building, its historic Greek Revival architecture and its renovation needs complicated the process of finding the right buyer. In the end, three proposals were received; one was determined to be practical and viable. 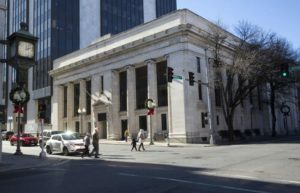 With a history of finding unique ways to match existing buildings with the needs of the community, Roanoke-area developer Ed Walker wanted to assist VCC in finding the right solution for the old bank building. He spent 2018 assessing potential plans. In mid-December, Walker asked if Carilion would be interested in purchasing the property. As one of the region’s largest economic contributors, Carilion was a natural fit. VCC chose to sell the property to Carilion because of its strong track record of supporting the community, its innovative use of other historic buildings, and its reputation in western Virginia. Carilion has had an important stake in the bank building for many years. The building’s neighbor on Jefferson is the Carilion Administrative Services Building. The two buildings share a common wall and some building systems. With the completion of the sale, Carilion will further evaluate renovation needs in the building along with its own office space needs. Plans for its use are still under consideration. VCC will soon re-engage with community members and other stakeholders in Roanoke on the most optimal use of the sale proceeds, with the ultimate goal of fostering economic development in the Roanoke region.